Over the last 60 years, as a pioneer in the freight forwarding industry, Parikh has transformed the family business—once small-time brokers in British India, they are today a complex, multi-modal logistics provider in 51 Indian cities linked to the world. Now, he says, with giant global partners such as Deutsche Post and DHL, and an estimated turnover of Rs2,000 crore projected for 2007-08, their latest joint venture, DHL Lemuir Logistics Pvt. Ltd, could turn into one of India’s largest logistics companies. Alongside all this, Parikh, a disciple of the late Ustad Vilayat Khan, has evolved into a leading sitar player, teacher and voice for performing artistes. He is currently spearheading an association of 12 icons of classical music, drawn from the Carnatic and Hindustani traditions, to create greater support in government, industry and the media for Indian classical music. Recipient of several musical honours, he is close to completing a video archive of 500 classical compositions. When asked how he manages, Parikh says simply: “I am equally passionate about music and business. And, I see that both have common features." 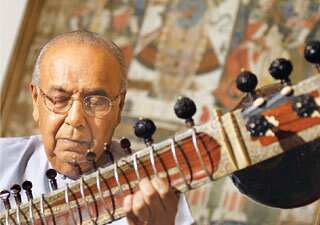 Look through both eyes but develop a unifying vision—this is a lesson Parikh picked up from his guru, the late Ustad Vilayat Khan,who was a man of many parts—equestrian and swimmer; snooker and billiards champion; as much at ease composing film music as singing or playing the sitar. Parikh reminisces: “Khan sahib could even re-fit a car engine! He loved fine suits, shoes and perfumes. From him, I learnt that to excel takes deep immersion." It was from his grandfather that Parikh inherited his love for the great classical artistes. He used to listen to Ustad Vilayat Khan on the radio, and at 17, made the move from Ahmedabad to Mumbai, determined to be the disciple of a guru he had never seen. And in an uncanny coincidence, met the Ustad the same day he got off the train at Mumbai Central. “I expected someone middle-aged, with flowing beard and Muslim topi. But there was this immaculately dressed man, the same age as myself, wearing tinted glasses and holding a ‘Craven A’ cigarette box in his hands!" In 1944, Parikh moved into his uncle’s flat, from where he simultaneously pursued his college education and his sitar taleem (tutelage). The ustad died in 2004, but he hasn’t been forgotten—today, Parikh will release a book that he has authored on the legendary sitarist, The Glorious Tradition of the Etawah-Imdadkhani Gharana. In the late 1940s, Parikh began work at Lee and Muirhead, a British clearing agency bought over by his father. Evenings were spent playing the sitar with his ustad. He says, “Maestro Ameer Khan once appraised my concert, saying, “Arvindbhai, vidyarthi jaise bajaya. Risk to lo, koi baat nahin agar besura ho jayenge...bade bade ustad bhi hoten hain! (It doesn’t matter if you go off-key, it happens even to ustads, but at least take a risk by improvising. Don’t play like a student who strums by rote!)" Parikh was quick to transfer such wisdom to the business scenario. In Nehruvian India, with its planned economy, he sensed opportunity: “We used our knowledge base as small-time agents to interpret the red tape of government tenders, which very few understood. We took on the challenge of moving heavy equipment for many PSUs (public sector undertakings) like Bhel, Fertilizer Corporation of India and ONGC." Parikh’s wife, Kishoriben, whom he had met while in college, remained an outstanding vocalist until she died last year; son Snehal also took to the sitar. If the maroon woollen Kashmiri carpet in the Parikh music room could talk, it would have more than a few tales to tell. Over six decades, it has seen none less than Bade Ghulam Ali Khan, with his penchant for bhajiyas fried in pure ghee, and Begum Akhtar, the thumri singer who insisted that Parikh accept her as his student. Night after night, doyens of Hindustani classical music rendered memorable bandishes (compositions) in this room; even now, the rhythm continues, with Parikh teaching students from 9pm to midnight after a day at the office. This ‘open house’ in music shaped the business outlook as well. Snehal says: “Twenty-five years ago, my father anticipated globalization in our industry. As president of Fiata, the international body of freight forwarders, he learnt how the industry operated overseas. So, he nurtured foreign collaborations, but finally made the difficult decision to deal with just one, resulting in our current joint venture." Cyrus Guzder, chairman of the AFL Group, a diversified company in logistics, courier and freight forwarding, reveals how, over the last 40 years, Parikh and he have been fierce competitors and also good friends. He says: “As officebearer of our industry association, he was my guru, sharing everything. He built my knowledge of the business so that I could compete with him. I’m now paying back by mentoring his son Snehal. And I believe such collaborative efforts will grow our industry." Last month, Guzder, also the honorary consul general of Ireland, sought Parikh’s help in organizing a concert of visiting Irish musicians and local Indian artistes. It was memorable, says Guzder, because of Parikh’s brilliant format: “First, the Irish played their piece; then the Indians played theirs. And in the grand finale, they improvised together, to a standing ovation." As the late ustad had taught Parikh so well, “Kuch bhi bajao, lekin apne rang mein rang dalo (Whatever you play, put your soul into it)."